I did the ride. About 20 riders. Good pace. My only complaint.. if you call it a complaint, at about the 15 mile mark everyone stops at Bean Town in Sierra Madre.... and after about 45 minutes everyone still looked firmly seated so I went on and finished the ride myself. Who had the pale blue w/ white trim Raleigh International.....? OUTSTANDING! Many times these "rides" are really social events with cycling as a theme. Last edited by cdmurphy; 01-08-18 at 01:10 PM. I missed it too. Been fighting a cold since just after Christmas. I think I have 16 miles for the year. I feel better, get out for a short ride, then back down again. Getting frustrated. Missing a lot of good SoCal weather ... except rain today. Hopefully next time. Stay healthy! Same, I've been dealing with two colds since early December, and have missed some of the best riding weather all year! Really annoying. I missed this last ride. 2018 is going to be a pretty hectic year for my wife and I so I wasn't able to go. The ride runs at about 12-17 mph depending on whether you lay back or stay up front. I was riding my root beer metallic brown with chrome lugs Italvega Super Special as set up for Eroica California 2017. However, I hadn't ridden this ride for about 4 months and no riding during December due to schedule, so my legs were a bit weary, last to pull into Bean Town. The Bean Town stop is usually 30 minutes or so, but sometimes longer if the conversation is lively and active. I caught up with at least 3 people, and met 4 new folks (one running a 70's Teledyne Titan, and Salvatore riding a 90's Torelli who also owns a similar to mine brown Torpado Gran Premio), so for me its all good. If you want to get the group going after the stop, just ask around if we're ready to roll again, many times, that will get things moving. With more people and more bikes, sometimes it takes a while to ogle all of them! Oh, was the bike below the one you were thinking of (I didn't remember seeing a Raleigh International this week). This bike belongs to Phil from Corona, he had just finished rebuilding and restoring it, and this was his first shakedown ride. I love the bike also because its EXACTLY like my brother's Raleigh Pro, right down to the color and size. Picture attached. Hey Cameron, sorry to have missed you this time, hope you get well soon. Hope everyone recovers from their illnesses. Even our fearless ride leader, Chuck Schmidt was unable to ride due to illness, although he was there at the start to greet everyone. The flu and cold season has been bad this year. If you haven't already, get a flu shot, even if it isn't covering very well. The boost in your immune system from the flu vaccine can aid in fighting any infection you get, and can still help reduce influenza from getting from the respiratory tract to the rest of your body, including the kidneys. Also, if you think you have the flu, get in to see your doc or urgent care as soon as possible. Antiviral Flu meds as below can significantly reduce flu symptoms, severity, and longevity and save you time off from work and the general misery of the flu. There are three FDA-approved influenza antiviral drugs recommended by CDC for use against recently circulating influenza viruses. Remember to stay away from crowds, any people or kids who are visibly ill, have coughs or runny noses, and minimize your physical contact with hands or objects that you pick up that others may have handled. Having and using Alcohol based hand sanitizer can be helful. And keep exercising or ride your bike on a trainer at home to keep fit, maintain your immune system, and working off the pounds from the holidays. Last edited by mech986; 01-08-18 at 06:32 PM. That's a beautiful Raleigh! I'm so sorry not to have seen it. I ride a Legnano Roma almost that color blue, and a Raleigh Super Course in dark green. As for flu, yeah, I had the flu shot, which usually works for me. I think this is just a nasty cold, I did have terrible leg aches at the start, but it's all head, chest and throat now, mostly head and nose. I don't usually get these colds. I went to the medicine cabinet for Robitussin, and it was dated 2014, so I got new. Here's mine. The Legnano I've had 54 years, the Raleigh I built from scratch (bare frame) last year. Last edited by Slightspeed; 01-08-18 at 06:52 PM. One recurring theme I am trying to push, especially for C&V riders, is to support and attend the Eroica California 2018 ride this year. Its a really fun time with so many like-minded bicycling people, but you don't have to be a huge C&V fan to have fun. 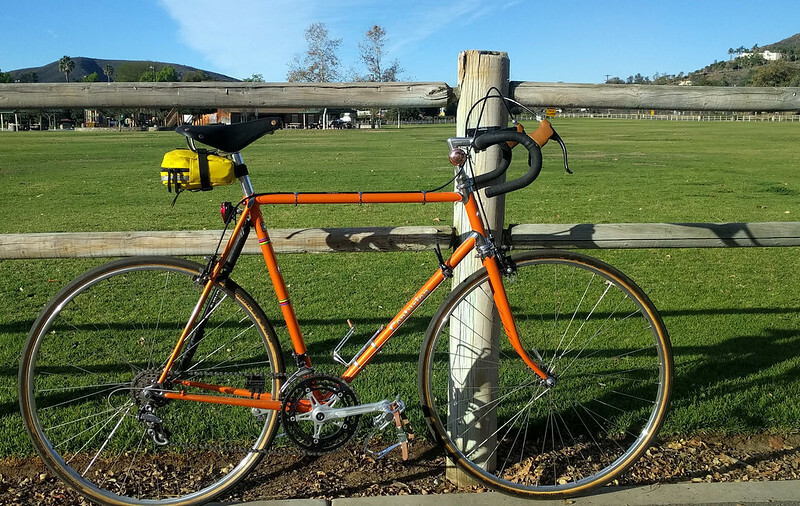 People bring all kinds of older bikes out to ride, and the fun is in the people, the machines, and the great ambiance of Paso Robles, home to >250 wineries, the California Central Coast, and the challenge of the 4 different routes. Putting on this huge event, all the logistics, and supporting the local Central Coast Hospice programs means getting as many riders and attendees as possible and continuing to grow and sustain the event. Last year there were about 850 riders, and I'm hoping it grows to over 950-1000 vintage riders (at least 10-15% growth). This can only happen if we spread the word and ask / encourage others to come and participate. Whether we agree with everything in the rules and regulations, have a bike that reasonably conforms, or the cost and logistics allow, I think we can agree that the only way to keep C&V alive is to expose more people to it, and the general idea of having fun on bikes. Housing can be had via hotel / motel, AirBnB, VRBO, etc. and bikes can be shipped in and out via Bikeflights.com. I know Gugie is organizing a big PNW contingent to come down. Airflights can be arranged into San Francisco / San Jose (3 hr / 2.5 hour drive to Paso), Monterey (2 hour drive), Santa Barabara (2 hour drive), or San Luis Obispo regional airport (via connections fromm Alaska, American, United airlines). I know people from Portland / Seattle and Phoenix / Tucson / Albequerque are coming, and I hope more will from all over the country if possible. I encourage all on this thread, the vintage ride, and any of your like minded friends to spread the word. Registration is currently $150 till March 15, then $175 till March 21, and $200 from April 1-7. Also new this year is Nova Eroica, an event the same day for modern bikes that will be held on 89 mile Coastal Route but in different, more competitive timed format. Eroica California is aiming for 200 riders under a different format so let all your modern bike friends know too. Ya, that's the Raleigh... I thought International, but it's a Pro. Frickin' stunning! Even put a piece of paper down to not scratch the pedal. I did do Mt Wilson from the RB and it took me just shy of 4 hours riding time. So doable by starting 6:30 or so. A 45 minute stop for a bite and small talk would be welcome after that climb. I hate to say it, but I had a better time on the Pasadena ride than I had on either of the two Eroica, California’s that I attended. Definitely better roads, less (bike) traffic and no toe clips required! But heroic? Not so much, fun ride though for lots less $$$. If you're anywhere close, come on out! Is anyone in for a few miles of climbing before the 11am roll out. Mt. Lukens (dirt) begins 8.5 miles from the Rose Bowl. STRAVA shows parts of Mt. Lukens to be 10 or 12% and I will likely walk a bit. I'll be at the parking lot with a white Subaru Forester and white Medici around 6:45am. Now that 7 am ride is tempting, will be out of town this weekend, but an early ride works much better. Always too many family activities mid morning, day. We had a good turnout, great weather. mid 80s on the Pasadena Vintage ride Sunday. Here's a few pictures. Great photos! Beautiful bikes! Wish I lived closer so I could ride with you folks more often! After 2 days of "winter" the sun came back out, and we had a good turnout for Sunday's Pasadena Vintage Ride. Lots of cool bikes, and discussion of upcoming Eroica CA. Pictures below. 11 am, 1st Sunday of the month, at the Rose Bowl Aquatics Center, Arroyo Blvd at the extreme south parking lot, if you're in the area. Last edited by Slightspeed; 03-05-18 at 01:21 AM. thanks for sharing! Yep, lots of neat bikes! Any idea of the story behind that Carnevale? Love the paint scheme! Almost a "Miami Vice" color selection. It belongs to a guy named Scott, I don't know if he's on BF or not. If so, maybe he could fill us in on details. There are more detail shots in last month's ride post, just above. Pretty bike. Last edited by Slightspeed; 03-05-18 at 10:25 AM. Thank you for posting beautiful pictures.